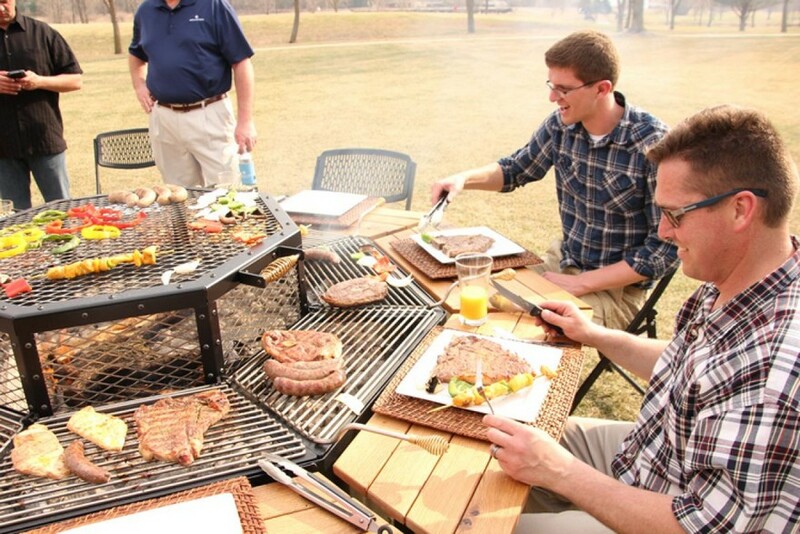 Spring is in full swing and this is the perfect time for admirers of the great outdoors, especially barbecues. As a general rule, the process of cooking meat is nothing to enjoy and this heavy responsibility is born by one “lucky” person, while the rest of the company just wait for the meal time. 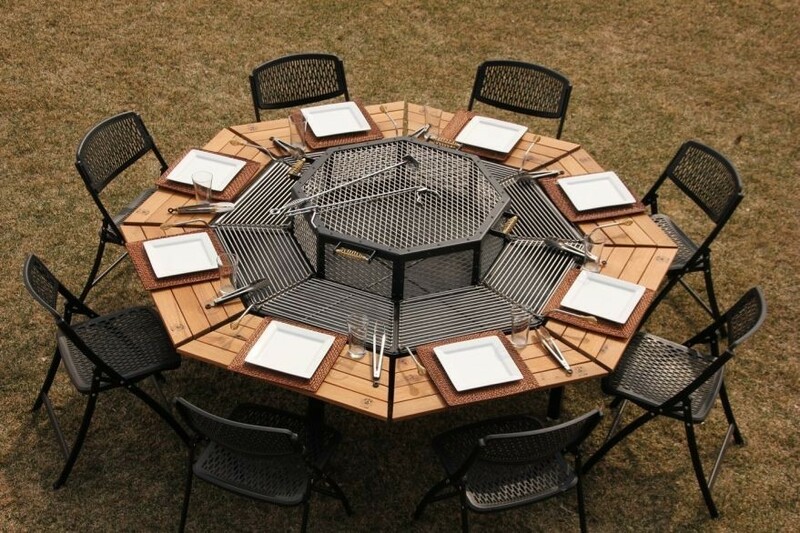 However, American craftsmen have already come up with an idea of how to make barbecues more sociable and relaxing. 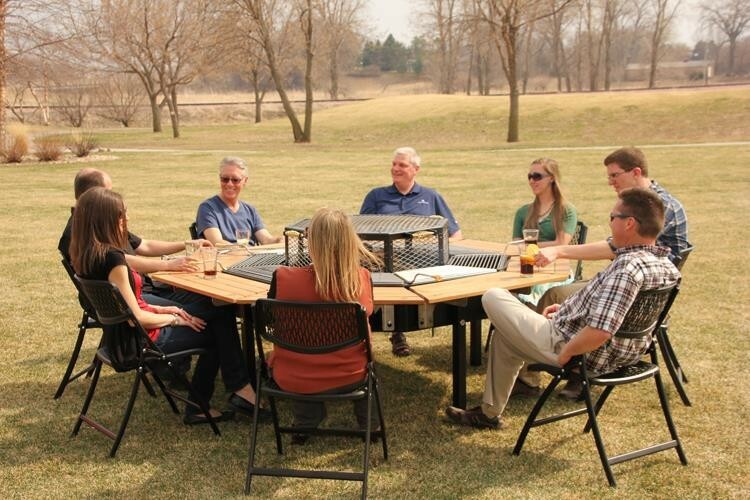 With the Jag Grill you can invite and bring to the table up to 8 guests. Each person will have an individual section of a wooden tabletop and a grilling station where he or she may cook meat, fish or vegetables to own taste and meanwhile enjoy the warm company of family and friends. The center of the Jag Grill is the firepit. It can be either left open to enjoy the fire when the charcoal or woodchips are burning, or closed with a removable dome when it’s time for food preparation. Besides, slow-roasting meals can be prepared on it. In case you need to add some firewood or charcoal, it’s a two-man operation to remove the cover. Being quite heavy, it comes off easily though thanks to four handles. Alternatively you can simply tilt it up at one angle, throw the woodchips or charcoal in there and set the dome back down. Just remember to put on oven mitts not to burn yourself. The 8 individual grilling racks, as well as the entire grill construction, are made in sturdy stainless steel. They are also easily removable for cleaning and storage purposes with just one quick twisting motion and put back with a gentle slide. The individual tables are made from fine hardwood and can be removed as well. To crown it all, for the sake of more compact and stackable storage the brackets on their back sides can be folded down. 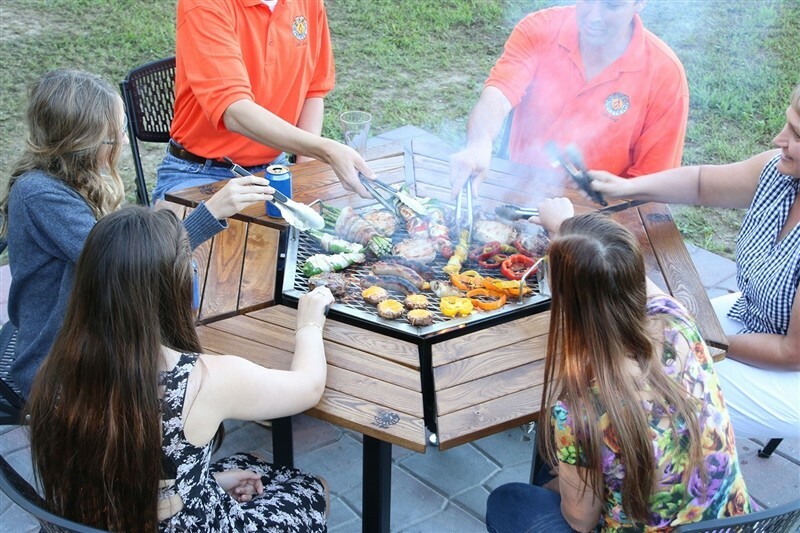 Under one of the removable tabletops you will find a side door, which is an entry to the pit of the grill. When you’re done with grilling and all the coals have turned cold, you can open up this door and just sweep out all these cold coals. And if there is any dust left, it can be sprayed out with a garden hose. So as you see, every detail of the Jag Grill is well-thought-out with convenient grilling, storage and cleaning in mind. Besides, the table has adjustable legs to regulate the height. Besides the 8-seat Jag Grill that we described above, the authors prepared a smaller and lower-cost six-seat model. Just like the Jag Eight, the Jag Six has an all-steel construction of the grill and hardwood (bamboo) tabletops, but the grilling surface is common for the entire company of guests. Anyway, no matter what kind of a Jag you choose – an octagonal or hexagonal one – it’s a perfect way to bring people together, to strengthen the family and have enjoyable time with friends.